In America, girls grows up with dreams of finding “the one” and having him romance her off into the sunset with old-school charm and wit. We hope that he will someday extend every courtesy our way, and above-all that he will be that chivalrous gem we’ve waited our entire life to find. In front of company, I show him respect. This might mean going above and beyond, or completing a task for him even though he is fully capable in the moment. It might mean I pick up after him without complaining, or I request politely something is placed away. This may mean I have to give this request more than once respectfully and without frustration. This means that when I disagree with him, I address him with a respectful tone. It also means that I will keep the house in such a way that it reflects honorably on him, and that I will dress in such a way as to show him honor. This doesn’t mean he has no part to play or work to do in our marriage. It’s actually quite the opposite. 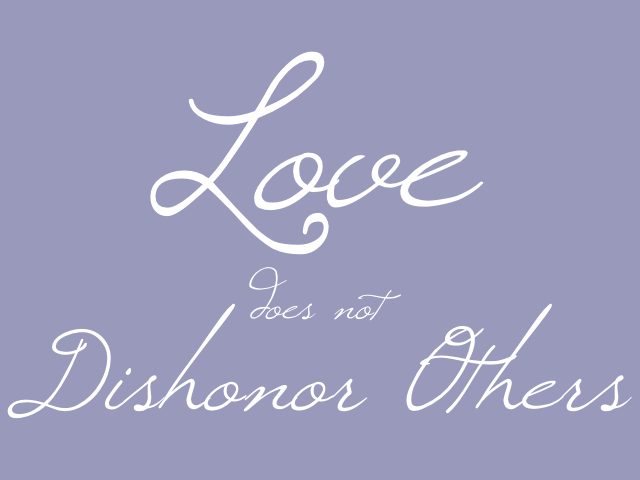 He’s accountable for these things too, but the Bible does not say, “If he does his part, you do yours.” Instead, it simply says that love does not dishonor. Every married individual wishes for and wants the best out of their marriage. We want it to be romantic. We want to share deeply, to love more, but we can’t even have the basic structure of love without honoring our spouses. Take the accountability on your own shoulders. Bring back the chivalry you expect to be given and give it to your spouse instead.